Sophomore midfelder Fernando Gutierrez won 154 faceoffs last season. It’s a little less crowded in Emerson’s men’s lacrosse locker room than new head coach Matt Colombini would like it to be. The Lions currently roster 15 players, a number that pales in comparison to NEWMAC opponents like Springfield (45) and Clark (41). The lack of depth means injuries hit harder and players wear down quicker. Sophomore midfielder Fernando Gutierrez said that in one game he was sidelined for last year, the roster shortage took its toll. Solving that problem will take more than one year. Colombini said he wants to start bringing in recruiting classes of 10 to 12 freshmen each year once he has built the program. Colombini hopes to have an expanded roster of about 40 players, more in line with conference foes, by 2019. He said new assistant coach Alex Krawec is concentrating on recruiting high school juniors who may be good fits for Emerson. Colombini, who took over after former head coach Dan Gold departed following the 2016 season, knows the Lions need to score more goals. They netted just 14 in seven conference games last season, and scored 64 times overall, eighth and last in the NEWMAC. Wheaton, the team that finished seventh in the category, beat out Emerson by 85 goals. But Colombini said part of avoiding blowouts like Emerson’s 25-2 loss to Wheaton last April is concentrating more on defensive pace, even if the Lions don’t rocket up the conference leaderboard in goals. Colombini said he prefers a fast-paced style, but realizes that wouldn’t be conducive to success with a 15-man roster. “With where we are as a roster, it would be irresponsible to play that way, and that’s not going to help us win games,” he said. Injuries derailed the Lions early and often last year. Attack Cam Radenberg scored five goals in three games before he broke his hand, ending his season. 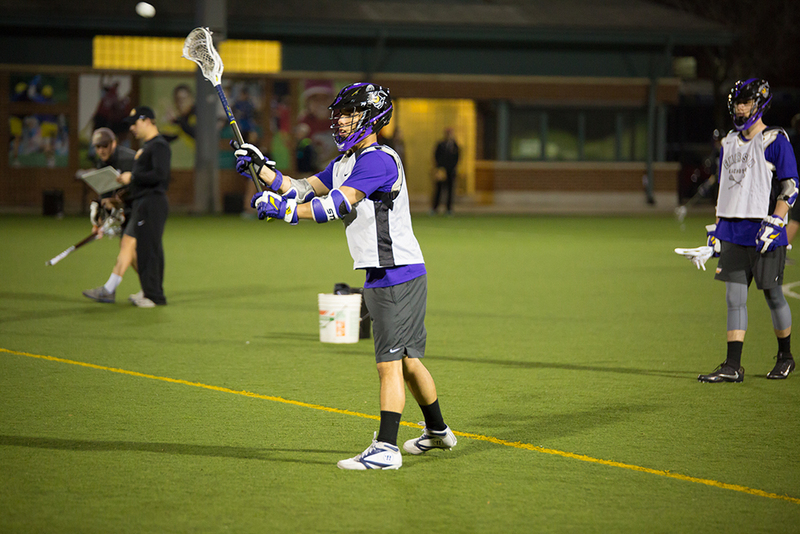 Fellow attack Jared Brush suffered a broken thumb. Gutierrez said Emerson’s offseason training focused on skills in addition to fitness, so players should be more prepared to step into a different role than they’re used to, if required. Colombini said he’s introduced 15 minutes of stretching before practice in an effort to eliminate minor injuries that the team can control. The annual NEWMAC coaches’ preseason poll ranked Emerson eighth and last in the conference after its 0-14 finish last year. Colombini said the first focus is on being competitive in nonconference games consistently—the Lions lost two overtime matches against Becker and Wheelock, but dropped four of their seven nonconference matches by ten or more. Senior defenseman Dan Terry, a captain, said his goal is to grow the program so younger players will have an opportunity to reach the NEWMAC playoffs before they graduate. Terry said Colombini has introduced a winning culture, and does a good job of focusing on the task in front of the team. “He approaches it situation by situation—who do we have, what can we do,” Terry said. As they try to score with more regularity, Colombini said the Lions will look to freshman Paul Seguin, who attends Massachusetts College of Art and Design, but plays as part of a consortium that allows students from MassArt and Berklee College of Music to participate in Emerson athletics. Colombini said Seguin, one of four freshmen on the team, will be part of the attack, along with Radenberg and Brush. Radenberg expects Seguin to add value on the attack and at midfield. Emerson will see its first game action of the season Saturday, meeting nonconference opponent Husson University at Rotch Playground and Field at 1 p.m.